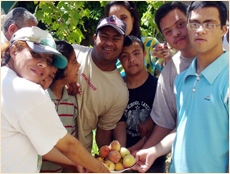 The Village of Hope is a non-governmental organization in Alexandria, established to provide much needed care and attention to one of the most marginalized groups in Egyptian society – mentally-challenged young people. This center also offers a day care that includes medical and psychological services. Young adults have the opportunity to attend vocational training programs designed to enable them to play an active role in society and to enhance their life skills. The students also participate in various sports. The center is very active in advocating for the needs and rights of these groups with national policymakers.